All schools repaints are important. Budgets have taken years to get into a position where the Board of Trustees and the Principal can undertake a once in a decade opportunity to give the entire school a lift through a fresh coat of paint. This year Carus Group will work with over 80 schools and universities across the country. Some projects though are personal. Like Southbridge School in rural Canterbury. This weekend Tamara Bell, the school principal and the local community will welcome alumni from across the world who have returned to celebrate the schools 150th Jubilee. The population of Southbridge is going to swell dramatically over the next few days. When you walk into Tamara’s office you see how organised and obsessed by attention to detail she is. The challenge now is to make the rest of the school as neat and fresh as the Principal’s office. This is where Carus come in. Could we get the school painted from concept to show ready in a very, very tight time frame? 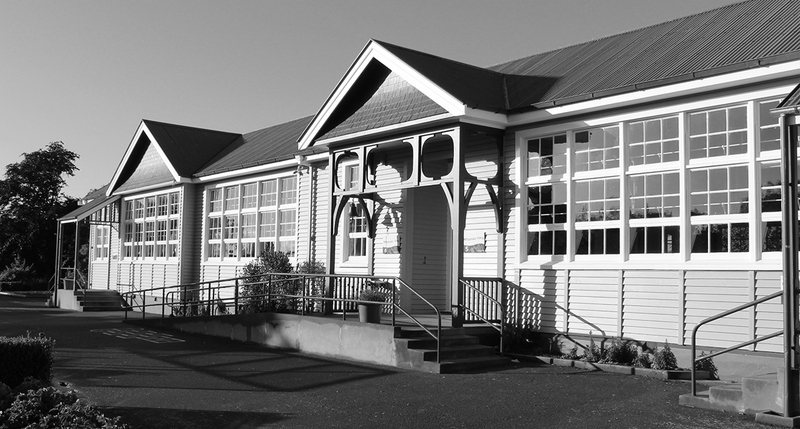 I was the one that stood in Tamara’s staff room where I met with the Board and promised we’d have their main historic, timber, weatherboard building fully prepped and painted in time for the event. At this point I should also mention, I live in Southbridge. On a remote, out of the way, private lane. It just so happens that the Executive Officer, Sonia lives two houses down and the caretaker, Sam’s house backs on to mine from the neighbouring street. So again, no pressure there then. If we miss this deadline or don’t deliver the quality that was promised, I may very well have to leave town. Let’s talk about the Project. How has it gone? Our first challenge, as with all buildings of this age is peeling away the layers from previous paint jobs. The quality of modern paint means that if it’s applied without sufficient preparation it will literally pull the older layers away from the substrate, creating bubbles. Principals remember the six P’s when painting your school. To fully strip the building is just not a cost effective option for any school. This means our teams have to partially chemical strip in some areas and manually sand and feather the hard edges, creating a rainbow effect from all of the previous coatings from years gone by. At Southbridge School this was a massive job. It took an enormous effort from all concerned. The operations management, that had to resource the job at short notice. The project management team for making sure quality standards and best practices were implemented throughout, and of course from the foreman and painters who have given Tamara and her Board exactly what they requested at our first meeting. We should also recognise the partnership of Nick Robinson from Resene who along with his team worked on the paint specification and colours with Carus and the school. As of writing this, we are one day removed from the start of the celebrations. Our team is doing last minute touch ups. The school is abuzz with landscapers, builders and marquee construction. A job made difficult in the final weeks as we’ve had biblical showers to contend with. Buildings have been demolished and removed, new drains have been laid, and murals have be painted. I have created a photo review of the progress of the painting and placed this on our Facebook page. Pop on over and have a look at the work to date. We will be back in the New Year to complete the painting on the additional blocks and classrooms and all being well give the school a new lease of live for the next seven to ten years. To the returning students, teachers and all participating in the 150th jubilee enjoy your celebration. To Tamara, your staff and the Board of Trustees, thank you for entrusting us with your painting. Having seen the incredible amount of work you and your team have undertaken over the last few months to get the school into this condition I think the entire Southbridge community needs to give you a tip of the cap. Now, let’s hope the sun shines. I’m assuming someone ordered the sunshine, right?